Excuse-makers are blamers. They might not point a finger in your face, but their failure will eventually be your fault. Successful leaders identify and counteract excuse-makers. All ‘good’ excuses are partially true. 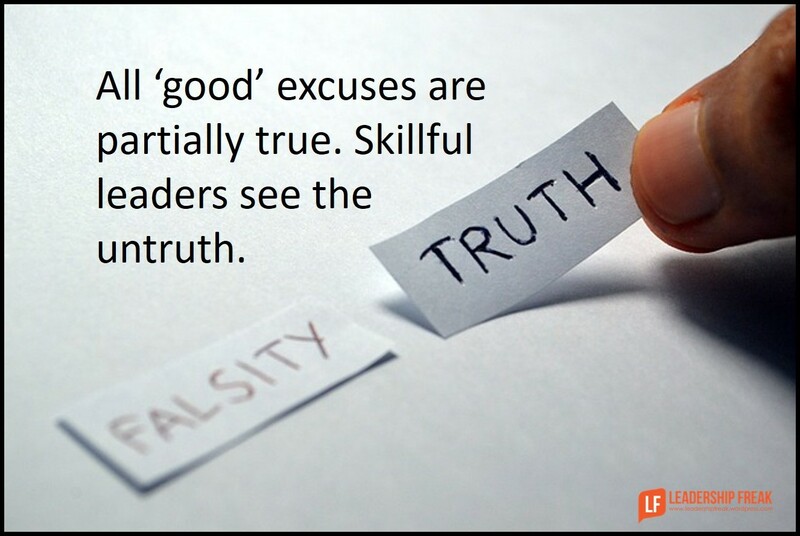 Unskilled leaders believe the truth and ignore the lie in an excuse. The excuse, “I wasn’t sure what you wanted so I didn’t move forward,” is a finger in your face. You are to blame for their poor performance. You weren’t clear. This excuse may be partially true. Successful excuse-makers cover their failures by giving work to others. If you buy into the truth that you should have been clearer, you’ll double your efforts to communicate effectively. The problem occurs when you ignore the lie in the excuse. They didn’t seek clarity. That requires responsibility and work from them. Something most disagreeable to excuse-makers. There’s little hope for habitual excuse-makers. It might be best to remove or marginalize them. It’s definitely easier. However, a commitment to serve the best interest of others suggests you should try. #1. Repeat what you were told. I hear you saying that you fell short because you weren’t sure what I wanted. It seems like I’m the reason for your failure. What might I do to be clearer next time? #2. Confront excuses. I need you to seek clarity. What are some ways you can seek clarity the next time you feel unclear? Listen carefully to an excuse-maker’s solutions. Beware of deflection. Reject more assignments for yourself. #3. Expect excuse-makers to work as hard as you. Half of the equation is improving your communication skills. The other half of the equation is them taking responsibility. How might leaders deal with excuse-making? I run into many of these in the daily effort to lift the team into high performance. Your passage reminds me of an old colleague who said he always works to “remove the excuses, particularly if they are system or tool oriented” because, at the end of the day, the root cause of the individuals issues will then be uncovered. Its at that point some useful personal growth usually occurs. It is worth remembering that an excuse maker generally follows that behaviour because it was reinforced in their early work life and they found success in its use. This is the same for many bad habits that people adopt. Initial efforts to correct this will be met with resistance and a doubling down on the excuses – simply to see if they didn’t come up with enough (surely more excuses will work). I’ve usually found that working with someone in this way eventually gets to the crux of the problem and the person starts to grow / develop or, not as common, they deny and get moved on. Nice post – thanks Dan. Thanks Rob. Your commitment to develop people is inspiring. I can see where you remove the excuses and others might emerge. Even then, it’s an opportunity to point out that the issue is more about the person than the circumstance. How “perfect” does a situation have to be for you to perform above expectation? 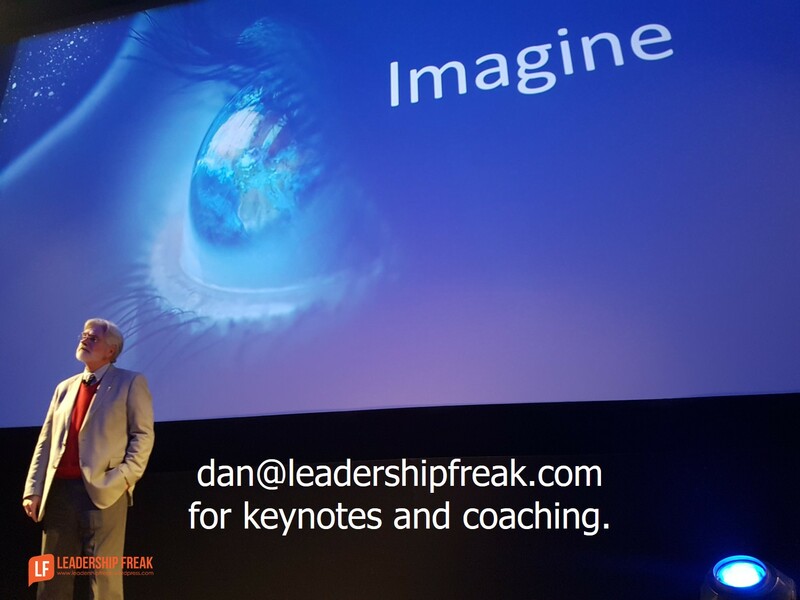 Dan – yes how “perfect” does your environment need to be before you try!! I’ve just been through a performance management process with a long-serving under-achiever who I inherited. You are so correct when you identify the deflection that they use, as well as the way they try to make you so busy ‘clariying’ and ‘finding out’ for them. These skills have usually served them well for many years which is why they don’t like being held accountable and tend to get very cranky and threatening at times. Love your work, as always Dan! Thanks Christine. The tolerance of long-term under-achievers encourages them to hang around. It’s difficult to deal with performance issues. However, not dealing with them only encourages and exacerbates the issue. Dan, this is a very thought-provoking post. Thank you. And here’s the thing. Every day a human gets out of bed and puts on their employee clothes to go to work. Where managers run into problems is that they treat people only on face value … as employees. What they ignore is the human below the outer covering of employee. So, “I wasn’t sure what you wanted so I didn’t move forward,” may well be pointing to a system problem (as Rob says above) or it may be something like, “the last time I took initiative you berated me in front of the team” or it may be a sign of disengagement, or many other reasons. Thanks M. I’m so glad you and Rob have added to the conversation. I tend to focus on behaviors that center on an individual leaders skills. An organization/system approach is an important addition. One thing is sure. We agree on digging below the surface. Listening to the message as well as the words. Like the added thoughts around previous history “maybe you berated initiative last time”. A key part of leadership is doing that reflection / review to see if you are in fact part of the problem. If you keep changing your mind – how do you expect the team to react other than retract back to the minimum. it’s basic survival. Asking your team to use initiative also requires you to exhibit tolerance, understanding and coaching while they are learning. In this manner they will discover unsuccessful approaches (not mistakes). As the leader your tolerance and willingness to coach will turn these small missteps into learning and build trust and confidence in your team taking initiative. As such I don’t mind taking the time to check their excuses. In doing so I also grow. Excellent sentiment. Thank you, all. Refreshingly optimistic post and replies. This post his home (and hard). So timely and helpful. Thanks and hope you are doing great. ‘Excuse-makers are blamers’. Never a truer word was spoken. On a deeper level, after trying to work with a compulsive liar I gained first-hand insight. This individual had serious and deep-seated mental health issues and was unable to accept any responsibility for his behaviour. I guess what I am saying is, scratch the surface and there might just be an explanation, not necessarily an excuse. The only safe course of action was to distance myself, one cannot rationalise with an irrational person, sadly one often can’t support them either. I’m an avid reader of your blog. Your posts are concise, clear and lead to action. I frequently share them with my peer group members & LinkedIn connections. Keep up your great work! So many well-made points. In particular, the importance of requesting that someone take accountability for their own actions, their own growth, their own skills or lack thereof and an action plan to fill in any gaps.